Chill martini glasses in freezer for 15 minutes. Add one rosemary sprig to cocktail shaker and muddle gently to release oils. Add ice to shaker. Pour in vermouth and vodka or gin. Shake vigorously. Remove reserved rosemary leaves from the base of each sprig and thread with an olive or two. Remove glasses from freezer. 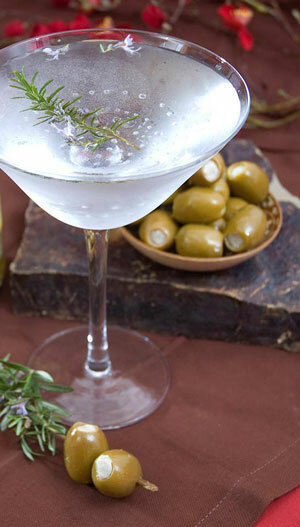 Pour martini into glasses through a fine strainer, (this will insure no rosemary bits end up in the cocktail). Serve with rosemary sprig and a generous helping of Jeff’s Garden Blue Cheese Stuffed Olives.